Tips for Finding the Gold at Cariboo, B.C. Beautiful British Columbia (B.C.) has a long and proud placer gold mining tradition and nowhere is this fact better illustrated than in the Cariboo Placers of the Barkerville District. Discovered in 1860, these rich placers yielded over 2.5 million troy ounces of gold over time, and there is still plenty of Cariboo placer gold waiting to be recovered by adept and hard-working small-scale miners. There are a number of different types of gold-bearing gravels that comprise the Cariboo Placers. These include Tertiary period alluvial and elluvial gold freed from higher elevation deposits and country rock during a time of geologic uplift, as well as deposits formed from the development of glacial valleys during the Pleistocene epoch. Both geological periods did their individual parts to help form the rich placer gravels of the region. Glacial stream gravels. The gold in these gravels essentially parallels that of the bedrock gravels discussed above. Look for the same sorts of mineralization and signs (types of water-worn rock and pebbles, etc.). NOTE: The biggest difference between the bedrock and the glacial gravels is that the latter have "leaner" paystreaks and contain both water-worn and angular rock. Glacial bench gravels. These auriferous gravels will typically be found "high and dry" above the current stream flows in the Cariboo area. Basically they are a type of "bench" gravel and tend to be quite erratic in terms of paystreaks since the placer gold in them is widely disseminated. NOTE: Good amounts of coarse gold is found in these gravels but not to the same extent of that in the bedrock gravels. Once again, look for a mixture of smooth and angular rock. Post-Glacial stream gravels. These placer gravels were formed at Cariboo after the main glacial action ceased in the region and, like their glacial "cousins" listed above, contain both water-worn and angular rock and pebbles. NOTE: Although also a type of "bench" placer deposit they can be distinguished from the regular glacier gravels by the fact they contain only fine gold in very thin and shallow paystreaks. In case you're wondering, the majority of the placer gold from the Cariboo Placers runs from .775-.950 fine (out of a possible .999 gold purity level.) If you get the opportunity to placer mine Cariboo and the Barkerville district, send me some photos of Cariboo gold. I'd really like to see these different variations of gold from the various auriferous gravels outlined in this post. Best of luck to all my B.C. mining friends and supporters. Keep coming back! 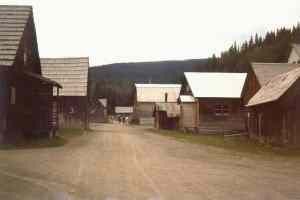 If you liked this post, you may want to read: "Gold Rushes of British Columbia, Part 1"